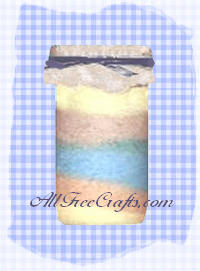 Colored bath salts are so easy and cheap to make that even small children can join the fun. This is an ideal classroom project, teaching primary colours and colour mixing, while the children get to make an attractive homemade gift for mom. Simple measuring, mixing, pouring and colour identification. Pour the salts into the gift jar, then divide more or less equally into six cups. Add food colouring to each cup. Start with the primary colours (red, yellow and blue), adding drops of colour until you get the desired pastel hue. Mix thoroughly with a spoon. Now begin to combine blue/yellow, red/blue, yellow/red, for shades of green, mauve and orange. Funnel each coloured layer into the gift jar, packing down each layer slightly with a spoon as you go. This part is like sand art; the layers don’t have to be flat or even, as hills and valleys only add to the visual appeal. Make sure the jar is packed to the top to prevent the layers from moving or mixing when you’re finished. Cut a circle of fabric to fit over the lid. Fasten with an elastic band and finish with a ribbon. School children could make a gift tag to go with their gift jar of bath salts, using colours to match those in their project. A nice treat for Mother’s Day or a wonderful Christmas craft!